I spend a lot of time thinking about living a simple life and what leads to getting there. I have written some posts in the past on the simple life. You can read those here. We live in such a complicated world, but I firmly believe that there are so many roads we can follow to get to the place where our lives become much more simple and serene. When I woke up this morning I was greeted by an unexpected sight. What was supposed to have been a trace of snow turned into five inches. 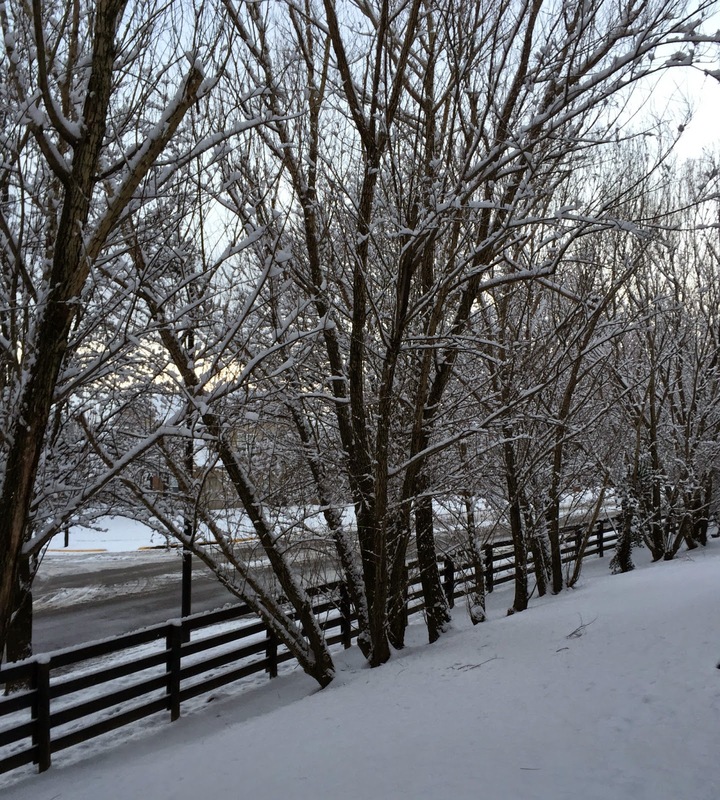 It was our first real snowfall of the winter, and although I am not really a fan of winter these days, I felt awed by the beauty that greeted me. Bundled up in my boots and heavy coat I took a few moments to just breathe in that simple beauty. I found a simple living manifesto by Leo Babauta. You can read it in its entirety here. Like Babauta I believe that the road to a simple life is one that leads us out of chaos and into simplicity. Babauta gives us 72 ideas to find that simple life, but as he says the short list is really about determining what is important to you and eliminating everything else. 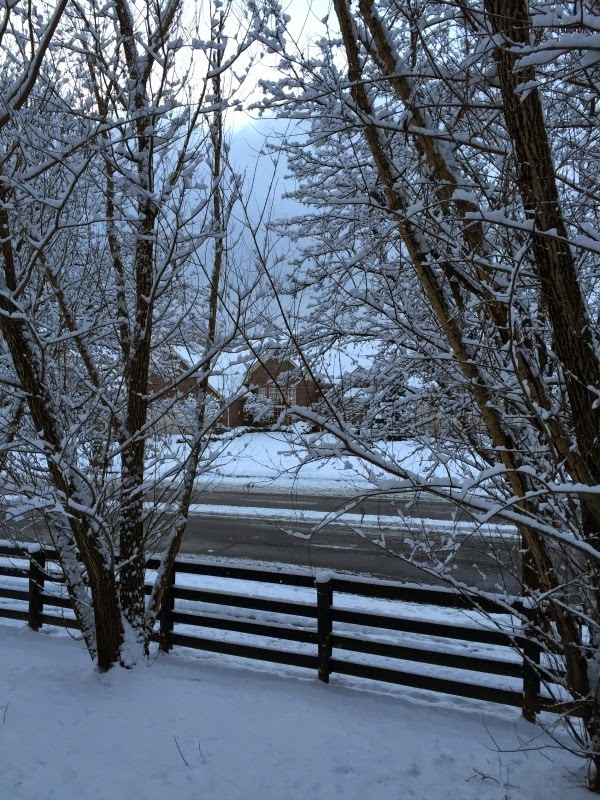 As I sipped my tea and looked out on the winter wonderland that is my neighborhood today, I was thinking exactly those thoughts, and I wondered what holds us back from doing just that. I am not going to go into those 72 things on his list today, but what I am going to do is think about and research those things. Then I am going to start devoting Saturdays to talking about them and about other ideas for simple living. Yes, our world is complicated and can be very chaotic, but the world has always contained chaos. I hope that we all can find our own bit of simplicity among that chaos. I know that I am certainly going to continue trying and I hope you will too. I definitely remember the days when we didn't have to lock the house or the car, Susie. We used to just walk into our friends and neighbors houses without knocking. Laura, such pretty pictures. I feel like doing a snow angel. I agree we would be far happier with a more simple life. A pretty sight to wake up to! I simplified my life when I moved to this little apartment. I stopped watching the news for one thing. Meaning Judy had to call me every time a tornado was headed this way to tell me to get the pupsters and hunker down in the little bathroom. Which she knows I'll never do. I like not knowing about every single thing. I used to read Newsweek and Time magazine from front to back every week. Then I realized that I didn't really want to know about all the new research and carcinogens in our environment. If something big happens in this locale, a reader from another state will faithfully make sure I'm informed. And so here I am, ignorant of all the goings on in the world, living a simpler life by not letting as much information complicate it. Isn't it wonderful living a simpler life, Brenda. I don't watch TV news either, but somehow I still feel bombarded by the news. It often makes me want to move out into the woods. I think living simple is going to be a more important part of everyday life. At least for our generation. We were to get snow and I think you got it instead. I think it will be heading our way tomorrow. We did get someone else's snow. Maybe you are getting it now, Debby. Pretty snowy photos. I like the fence. It's snowing here tonight and coming down pretty fast. Have a cozy evening. I think you get a whole lot more snow than we do, Pam. Have a wonderful Sunday. Laura, I look forward to joining you on this journey to simple living. I look forward to reading about these 72 steps! I hope it will be both educational and fun for all of us, Linda. love your snow....a good snow fall is good for the sole......I love them...it keeps things calm for a while and lets nature take its course....Yes we live in complicated times but we need to ( just as your doing) try our best to take control.....its 2015 and our children and grandchildren are next to live and are changing the world ....but its good to see how many are getting back down to earth....growing gardens on rooftops, recycling, caring about the earth.....so keep on being simple as the more of us that do ..the better the world ...Your a wonderful person ..Love your blog.....do you remember that book called BE HERE NOW ? I don't remember that book. I'lI have to look it up. I do love that the younger generation is getting back to nature and a simpler way of living. It's imperative that we leave this world as a better place for those who come after us. It really does change the way we look at all aspects of life, Laurie. It is very freeing. It was lovely. It's busy melting away now. we also woke up to snowfall. We were only supposed to have a trace but we have 3 or 4 inches. Just enough to make it beauitful! BUT just heard there's a lot more where that came from! I am also simplifying!!!! So I really enjoyed your post! We are supposed to get rain today, Linda. I don't think we have any more big snowfalls in our forecast. Glad you enjoyed the post. Beautiful snowfall shots! Fresh snow always covers everything with a fresh layer of peacefulness. It does give such an amazing sense of peacefulness. Gorgeous photos, Laura. We had our first big snowfall yesterday. Hope I think it's as pretty after the blizzard tomorrow nite. Have a great week. Thank you, Katie. Stay safe. We woke up rather surprised by this snowfall as well! It was beautiful, but didn't last long! I think ours lasted a little longer than yours did, Michelle. Then the rains came.